The lighting industry is undergoing its second major transformation in the past twenty years. The first transformation, beginning in the late 1990s, introduced energy-efficient, high-brightness LEDs across the full range of professional lighting applications. The second transformation, which is unfolding now, builds on the digital nature of LED technology to bring illumination and IT together, allowing lighting systems to participate in the Internet of Things (IoT). 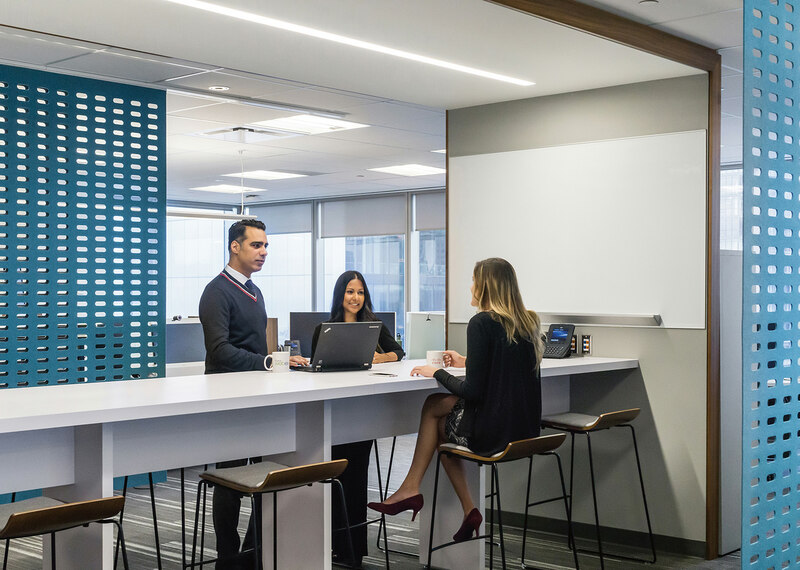 A connected lighting system from Philips Lighting at Cisco’s Canadian headquarters in Toronto creates a cuttingedge workspace for employees, and clear visibility to operations for facilities managers. The luminaires provide much more than simply illuminated office space — they are a portal to data, energy savings, sustainability, and personal comfort. 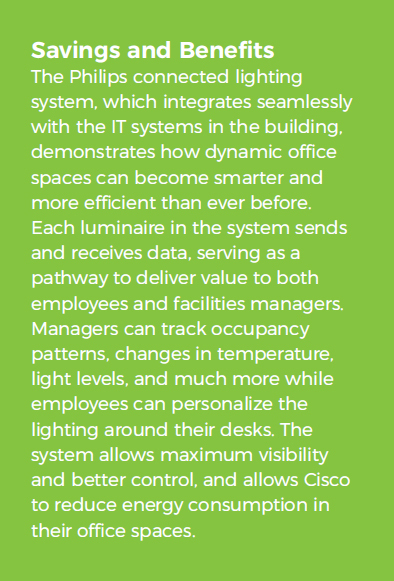 The luminaires merge with the base building’s IT network and are uniquely identified by IP address, allowing them to be individually monitored, managed, and controlled. The Philips connected lighting system collects data from 600 PoE-enabled luminaires equipped with sensors to capture temperature, light level, and activity for optimizing user comfort. Philips Envision lighting management software, running in the building’s IT environment, allows system managers to monitor and manage each light point via a dashboard application. The system also stores data over time, allowing managers to assess occupancy patterns and optimize lighting operations based on historical trends and findings, and opens up avenues for innovation into data-rich applications. Operating the lighting system is seamless, with easy visibility to each fixture, allowing facilities managers to respond to maintenance issues faster, lowering labour costs. 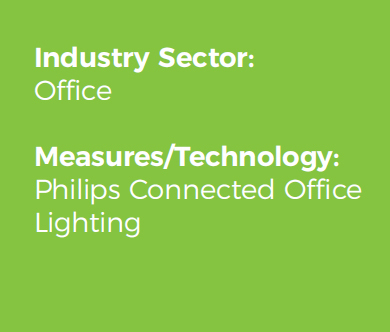 The Philips connected lighting system integrates seamlessly with Cisco’s Power over Ethernet (PoE) IT architecture. PoE is a technology delivering power over standard Ethernet data cables, eliminating the need for a separate power infrastructure. With revolutionary technology from Philips and Cisco, the future of workspaces is looking bright. 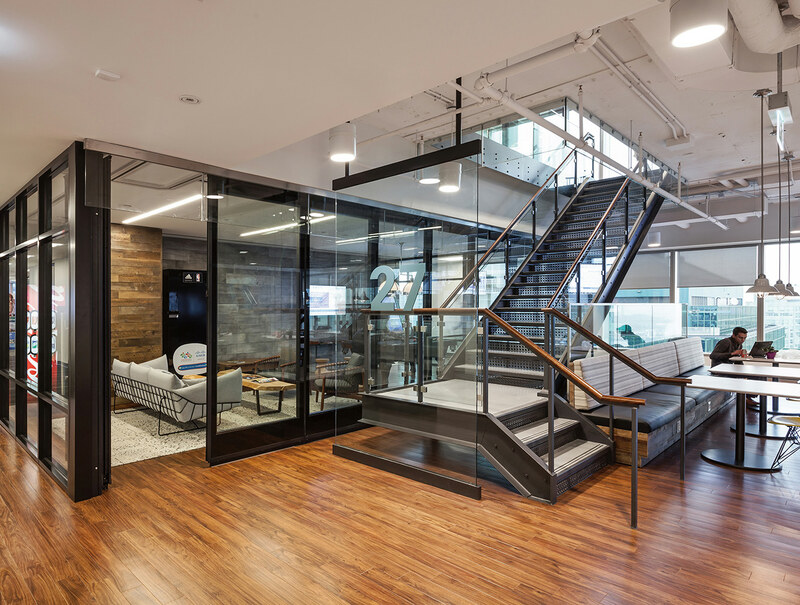 With lighting that can inform owners of maintenance requests, occupancy trends and temperature control, offices will become more efficient, more sustainable, and more comfortable.